James Coleman is one of the earliest ancestors of many Coleman descendants found in America today. It is believed James was born in Scotland in 1728, settled in Pennsylvania, and died there, Not much more is known about him. According to the "History of Logan Township" (Blair County, Pennsylvania) there were are least 3 Coleman sons that settled in this area of Pennsylvania. They were Michael 'Malcolm' Coleman, Thomas Coleman, and John Coleman. "The earliest explorers/settlers in the Logan Township area were brothers, Thomas and Michael Coleman. Previously, the two, along with a younger brother John, had resided along the west branch of the Susquehanna River. One day while the older brothers hunted, John was attacked by Native Americans and boiled to death in a kettle. After burying their brother, the Coleman brothers moved to what is now the northern part of Logan Township; where they settled permanently around 1770." Michael Coleman (son of James, b. 1828) was born in 1740. He married Margaret about 1759. They had 6 known children. The following excerpt about Michael Coleman is from "THE COLEMAN BROTHERS, Revolutionary War Militiamen, Pennsylvania and (West) Virginia Pioneers and Their Descendants", compiled by Georgie Kratzer Allen, research assistant, Beverly Yingling Peoples, Baltimore : Gateway Press, 1987. "MALCOLM COLEMAN was probably born near Carlisle, Pa. [Lancaster County - now Cumberland County, PA] in 1740. There is a possibility he was born in Scotland and immigrated with his parents as a child. In 1763 he was living near the Susquehanna River when the Indians killed his young brother. In 1773-1778 he was listed in the Bedford Co. Militia. In April 1787, Michael Coleman and family and son John and family from near Carlisle Pa. arrived at Fort Belleville (W)VA. It is recorded that he [MICHAEL] had performed garrison duty at Fort Pitt, Fort Harmer (Marietta), Fort Henry [Wheeling] and Fort Belleville [Virginia - present day Wood County, WV]. They arrived with four other Scotch families. In February 1793. "A party composed of Malcolm Coleman and his son John, James Ryan and Elijah Rixley, left the garrison at Belleville for the purpose of getting a supply of meat. They descended the Ohio in a pioroque to the mouth of Big Mill Creek, then proceeded up that stream and encamped near the site of Cottageville. In a few days their boat was loaded with a supply of venison and bear meat. Meanwhile the creek had frozen over and they were not able to reach the Ohio. Thus detained, John Coleman and Elijah Rixley returned overland to the garrison for a supply of flour and salt. They were expected to return from the garrison on the morning of the third, and Malcolm and James prepared an early breakfast. While Malcolm was invoking the Divine blessing, the Indians in ambush poured a shower of balls upon them, and Coleman fell dead. Ryan, but slightly wounded, made his escape and conveyed his sad intelligence to Belleville. A party set out at once for the camp, and arriving there found, it plundered and the body of Coleman scalped and stripped of its clothing. The body was buried on the spot and the party returned to the garrison. From that time John Coleman became noted as an Indian hunter, never losing an opportunity to run down and kill every Indian that crossed his path in revenge for this wanton murder". 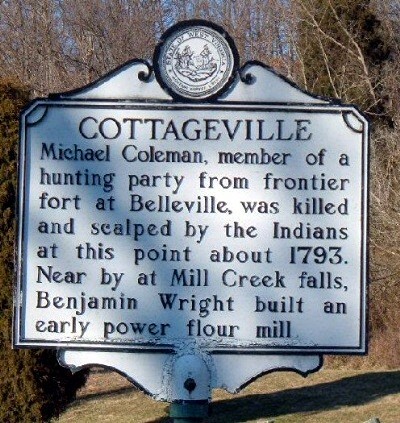 In the town of Cottageville, there is a marker off the highway situated in a little road side rest area that reads: "Michael Coleman, member of a hunting party from frontier fort at Belleville, was killed and scalped by Indians at this point about 1793..."
James Coleman (1775-1803), the son of Michael Coleman, was born Cumberland County, Pennsylvania. He married Nancy Anderson. James died in Ontario, Canada at age 28. Nancy died a year later in 1804. 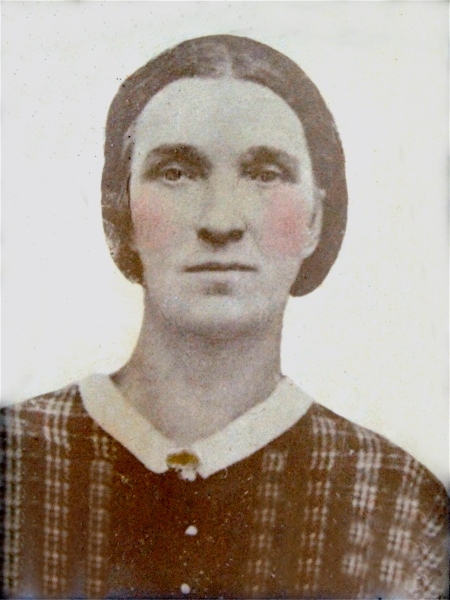 James and Nancy are known to have 2 children: Mary "Polly" Coleman (1796-1853) and Thomas B. Coleman (1801-1890). 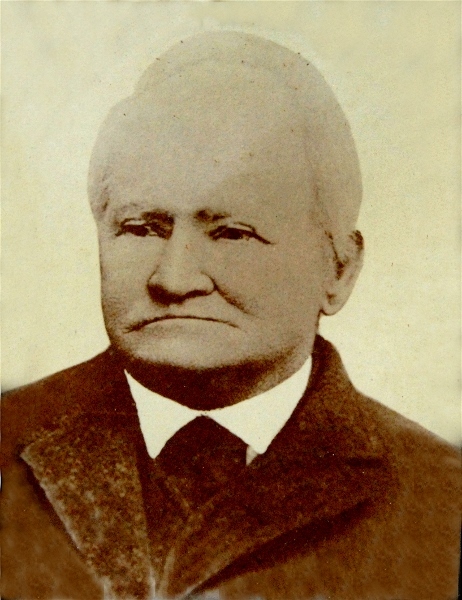 Thomas B. Coleman (1801-1890), the son of James (b. 1775), married Sarah Roush (1805-1882). They are known to have 10 children. They are both buried in the Coleman Cemetery in Lone Cedar, Jackson County, West Virginia. Thomas Coleman (1748-1833). the son of James (b. 1828), was born in Cumberland County, Pennsylvania. On 24 Aug 1781, he married Ophelia Phoebe Gray (1763-1837). They are known to have 9 children. They are both buried in Grandview Cemetery, Altoona, Blair County, Pennsylvania. The following excerpt about Thomas Coleman is from "Military Services and Genealogical Records of Soldiers of Blair County Pennsylvania", by Floyd G. Hoenstine, Telegraph Press; Hollidaysburg, PA; 1940, Page 33. COLEMAN, THOMAS - Served as a Private in Bedford County Militia, appointed an Ensign in Rifle Regiment and acted as a volunteer spy and guide for various expeditions. "That in the year 1777, he, with a number of his neighbors, who lived in what was then considered the very frontier settlement situate in said County, then known as a part of County of Bedford, collected into a fort called Fetters Fort situate in Frankstown Township in said county, during which year he began to exert himself against the Indians and in the service of the United States; that in the month of November in the same year he discovered the tracks of a parcel of Indians pursuing the path from Kittanning towards Frankstown; that he followed until he found them in the act of making their fires; that he immediately warned the inhabitants of the settlement of their danger who made their escape and that he assisted in collecting men to attack them the following night when five of the Indians were killed and wounded. From that time deponent became a guide to the different companies of men that came to protect the defenseless inhabitants on the frontier. He also turned out and followed the Tories who had meditated the death of the defenseless women and children by joining the Indians and conducting them to the settlement and followed them to the Cherrytree on the Seuwuehanna in the most inclement weather when we encamped and deponent was the first man chosen to proceed to Kittanning to discover, if possible, if the Tories had formed a Junction with the Indians." On the 1st of August, 1780, he was commissioned by the Supreme Executive Council of Pennsylvania an Ensign and served under Captain John Moore. His commission was for a period of seven months. He afterwards continued his services as a spy and guide to all that called upon him, during which time he served under Colonel Jack, Captain Black, Colonel Piper, and others, and ranged the frontier to Hannastown and as far as Fort Pitt. "We frequently marched several days without anything to eat. At one time pursued the Indians to near Kittanning. Our jerked beef was out. We then had nothing to eat for four days." Thomas Coleman was born in Cumberland County, in 1748, and resided in Logan Township, Blair County, near Altoona. He died the 2nd of February, 1833; and is buried in Grandview Cemetery, Altoona, and was survived by his widow, Pheby, and the following children: John, James, Thomas, Absalom, Michum, William, Sarah married to Frederick Yingling, Catharine married to William Scandred, Margaret married to Thomas Williams, Margaret married to William Bennett and Nancy married to Daniel McCauley. Click on the following links to view information on the descendants of James Coleman to the present. The 1st two reports are generated by the Legacy Genealogy program. (Report with documentation also available). The 3rd link is a biographical sketch of Thomas Coleman published in 1892.